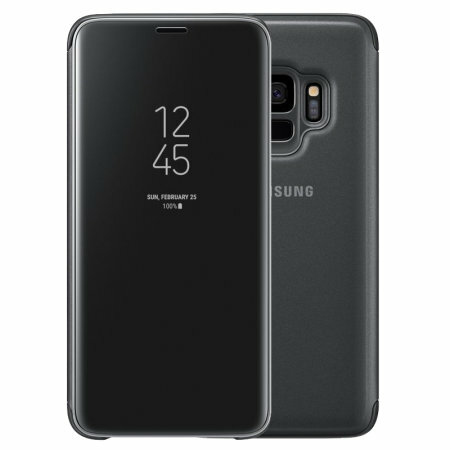 This Official Samsung Clear View Cover in black is the perfect way to keep your Galaxy S9 smartphone protected whilst keeping yourself updated with your notifications thanks to the clear view front cover. I bought this case for my new phone as I'd used a cheap case on my previous one. As a result my phone was damaged when dropped, so I'll never skimp on protection again. This seems sturdy and well made. I would recommend. Love this case!! Its so light and easy! And love the colour! Great cover and reasonable price (reduction on RRP). Official Samsung cover for S9 which seems quite sturdy and great quality. It did take a little time to set up the AOD to work correctly with Pie/One UI, but works fine with this software. Would be 5 stars but I didn’t realise edge lighting does not work with this cover when it is closed. Very quick delivery (3 days). Generally very happy with this purchase. Best case I've ever used. Love that you can answer calls and talk with the cover shut! Genius. It doesn't have a magnet to hold front cover shut but it generally stays shut anyway. Gorgeous looking and sturdy. really nice case, mobilefun is awesome providing customer service, i would definitely buy again. Love this case, best one I have had. Would definitely recommend. It fits, it feels strong. It’s easy to use. I bought the case as a present after purchasing one for myself! great quality. Came quickly enough also. Perfect just what I needed and love being able to answer my phone without having to open it. Buying one for my son for a galaxy noylte 9. The case is lovely and doesn't retract from the good looking phone. I wish there was a clasp to keep it closed and protect the phone if you drop it. It's a really cool cover, but it doesn't lock and unlock the phone when I open and close the cover. The magnet is faulty. Good quality case thar certainly protects the phone in every day use. Good quality product very happy with my purchase would highly recommended. I ordered a phone case for my phone and was very happy with my purchase. I did pay for next day delivery and unfortunately that never happened which was a shame. We would have liked to have known if the phone was a good secure fit and all openings to camera etc were clear with no obstructions which they are on both accounts. This product is great. Love the colour and does exactly what it should. Got for a great price compared to NZ suppliers. Postage to New Zealand was slow. But that's my only complaint! This is the best phone case I have ever bought. I saw the product in a Samsung store and I liked it. It works according to the expectations. Price was it worth it? This product delivers on its claims. Easy to fit. Love that the screen automatically comes alight when case is opened as its so much easier to add my pin rather than finding then clicking a button before logging in. So good to see time so easily = I don't have to take phone out of handbag. Colour perfect match for the phone. Protects the phone well. Have recommended product to my friends as I believe its that good. Excellent phone protector just a little expensive. Great quality and protect the phone well nice quality feel to it. Very Sturdy - I've dropped it a few times already and not even got a mark on it. Very chunky, the phone accounts for probably 1/3 of the size of the case, most of it is from the kickstand on the back, which is very well made and held shut by magnets. I love this case. Compact and stylish, I chose the same colour as my phone and it looks great. Protects the whole phone and love that you can see the time, who's calling and answer the phone with the case still closed protecting the screen. Great case, feels really good in the hand & provides great level of protection. I am totally delighted with this purchase, and only today was showing it to a friend who immediately wants to buy one. I couldn't be more pleased with this purchase.